The moment the title card came up at the end of Gravity I was ready to see it again. It has that type of effect on you where despite the fact what you've been a part of over the last ninety minutes was completely terrifying, completely out of your comfort zone, completely eye-opening and maybe to certain things you wouldn't want to admit; it was still so exhilarating that you want to experience it again and immediately. That is the kind of reaction I expect most people will have as they leave the theater and begin to reflect on what they've just witnessed for not only is it a visual delight, a technological wonder that defies all convention and expectation, but it never forgets story and character, the two driving forces behind anything worth telling. If there isn't an engaging story, a narrative to pull us in and recognizable characters, people with whom we live vicariously through or sympathize with in their moments of need and desperation then there is no connection to the film other than that of a superficial one. 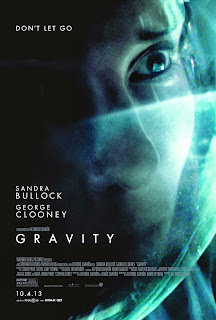 Director Alfonso Cuarón, who made the well-received but little seen Children of Men and my personal favorite Harry Potter film (The Prisoner of Azkaban), has crafted what could easily become one of those defining moments in cinematic history where the mythology that will no doubt come to surround Gravity will be as great as the content of the film itself. This is a game-changer in ways only those who hope to create something bigger than themselves, something that pushes the boundaries, but does so for the right reasons could only hope to achieve. 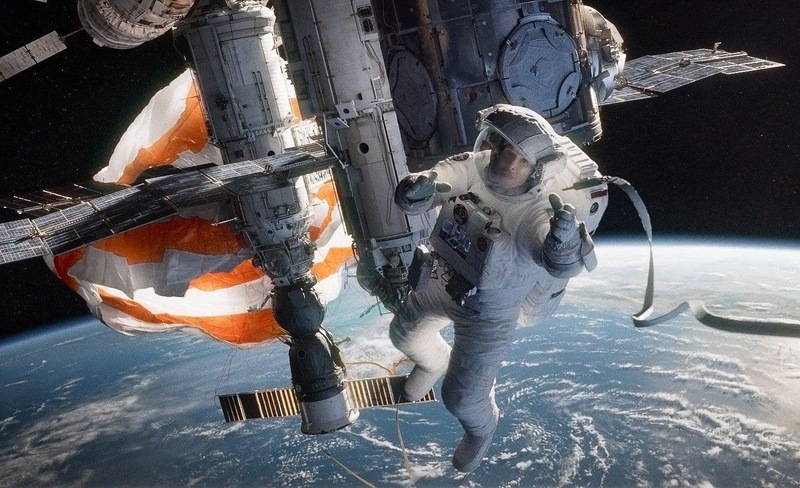 It is a film that as far as I can tell best captures the feeling of being in space without actually having to go there. The vastness of it, the colossal weight of what it means, the beauty of it all, yet the film also comes to carry much more weight than simply functioning as a National Geographic tutorial on space travel while teaching a lesson about the consequences of space junk; it is a story about existence, about human nature, about the will to live and everything that comes along with these giant themes that are as extensive as the universe itself. 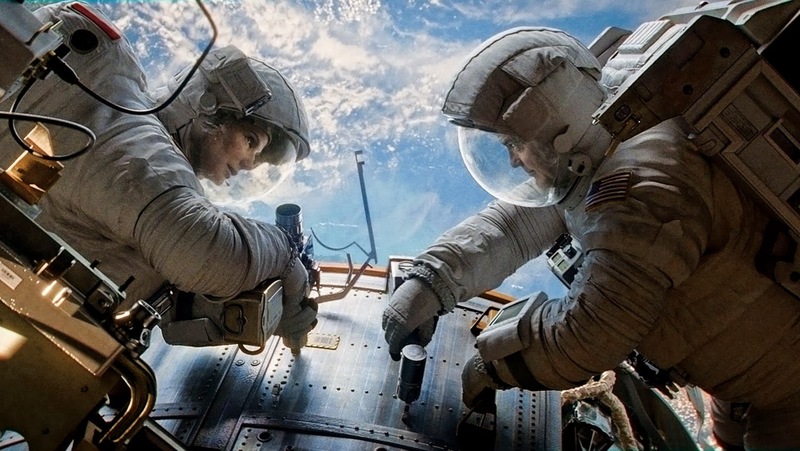 Dr. Ryan Stone (Sandra Bullock) and Matt Kowalski (George Clooney) in Gravity. Opening with a spectacular shot of the overwhelming earth we slowly begin to hear chatter, the voices filled with Nasa jargon that we recognize if not fully understand at first. Out of the corner of our eye we see something begin to move in the upper right corner of the screen. As it grows closer the voices become louder and we realize it is a spaceship and one on which a few astronauts are operating. It is an immediate reminder of how small we are when compared to this expansive thing appropriately called space. The first fifteen minutes or so introduce us to these astronauts as they float around and work on the craft. Sandra Bullock is Dr. Ryan Stone an engineer on her first mission and George Clooney is veteran Matt Kowalski who is currently on his final mission and they are also joined by Shariff (Paul Sharma). Stone and Shariff are connected to the structure, held in place and working hard and fast so that they may complete what is necessary and return to the convincing safety of the ships interior. Kowalski meanwhile orbits the craft and speaks back and forth with mission control (voiced by Ed Harris, a nice touch considering his involvement with both The Right Stuff and Apollo 13) as if he were hanging out at a Sunday Barbecue. We see the nervousness, the unsteady hands, the pure fear with which Stone operates in her nearly frozen position while accepting the ease with which Kowalski comforts everyone around him. We are given these early moments of calm, despite the fact we are still on the edge of our seats due to little more than the environment, to get to know the personalities of the human element this film will carry and Cuarón along with his son Jonás have crafted such a subtle script with a simplistic approach that these introductions are done with a true naturalism that isn't forced, but more a necessity of the circumstance. It is in these small moments that I came to be surprised by the film and the way it impacted me. To fully understand why Gravity works the way it does is to look into how it uses the technological aspects of its achievements to feed the audience a much bigger picture, a better understanding of what the point of all this might actually be as well as providing moments of pure terror and entertainment value. The visuals alone are worth the price of admission, but what you get in return is something you may consider in your daily life and that the wide shots of astronauts floating alone into deep space will re-enforce these ideas and thoughts. It is the heart of the film that will continue to carry weight hours and days after seeing it as much as the views take our breath away. In the aftermath of a Russian satellite being destroyed its debris begins rushing toward Stone and Kowalski's Explorer causing Houston to force the team to abort the mission with only seconds to spare and clear the space of the oncoming threat, but they're too late. This sets up the core of the film which in turn becomes a survival mission and lends the film the ability to discuss the more internal aspects of who these people are, who we are in the grand scheme of things and what makes this life worth living, if anything at all. While we are given the sense of how fragile and easily dispatched these counterparts are even in their massive suits that protect them from the increasing number of threats stacking up against them; we realize even more how easy it is to become lost and give up when it seems there is absolutely nothing waiting for us or no bigger purpose for us to serve. Cuarón has crafted a film that meshes these big questions into a single, direct piece of work that doesn't so much intend to answer any of them as much as it does put them into a context that may help us better understand. Where we might expect to go into this film and be taken on a wild adventure with a look behind the curtain at a job many of us wouldn't dare take on we come out having received both that and a journey of the human psyche that has been dealt blow after blow, not only in the aftermath of this disaster, but in the life preceding her first mission. The simplicity with which Gravity conveys these ideas is its strength as it doesn't need to be overly-pretentious or mystical to be provoking, but simply looks to the facts of the tiny part we play in the universe and how our immediate problems can so quickly be dwarfed by the enormity of what has yet to be discovered. It is in small, fleeting moments that Cuarón allows his camera to float and settle on a well-framed image that we come to see his masterful storytelling not only through the actors voices and actions, but in how their situations are visually presented to us. A shot of Bullock's Dr. Stone as she cradles herself into a fetal position and attempts to maintain control over her breathing and calm her heart speaks volumes more than any dialogue could explain. The same could be said for multiple shots that focus on the random objects that litter the space crafts our astronauts move in and out of. Whether they be a picture of Jesus in one satellite or the Buddha figurine placed above the main controls in a Chinese satellite. It is all present to re-enforce the meanings and themes Cuarón and his son intended to explore when writing the script as much as the extended shots (including a 13-minute long unbroken, opening shot) are intended to elicit the feeling of what it must be like to float weightlessly through an endless nothing. Ryan reaches for her tether in hopes that she is able to stay connected to a structure. While all of this is fantastic and makes for one of the most engaging and absorbing movie-going experiences I've had in quite some time it would undoubtedly be little more than a ton of style over substance were it not for the actors being able to place themselves in these situations and delivering a genuine emotional performance that doesn't ground the fantastical elements of the picture, but makes us believe in them. While Clooney is ultimately his charming self if not a bit of a cheeseball, our surrogate throughout is Bullock's Ryan Stone. As with what I assume will be most of the audience, this is her first foray into space travel and so we understand her uneasiness and her hesitation to even move as one wrong movement could send you in the wrong direction with no hope of making your way back to where you need to be. It may be easy to dismiss just how difficult giving a performance like Bullock has done here is, but trust when you see her succumbing to the physical aspects of the role that it is just as much acting as she is doing as when she is delivering dialogue. Much of the running time Cuarón requires Bullock to carry the weight of the entire film and she is able to do this with what appears to be a large amount of pure determination (a trait Dr. Stone doesn't always possess making it even more impressive Bullock was able to mask what her acting mind was telling her while allowing her exterior to express only what was necessary for her character). The way in which Cuarón places his camera as it moves from a third-person omniscient point of view to the interior of Stone's helmet where the only sounds we hear are those she hears (her hard breathing, her voice going through the microphone, the echo of Kowalski) and the only visual we now have is the limited view through her visor as she searches frantically for a space station only enhance the performance Bullock is giving as she transcends the insane scenario she's been placed in and engages the audience based simply on who she is as a person. There is much more to be said for a film such as Gravity, a film that reminds us why we go to the movies in the first place, a film that demands to be seen on the biggest screen possible and pushes visual storytelling to a completely different level as it accomplishes a complex sense of filmmaking not often witnessed. Still, it is impossible to encompass the true impact of this film in words for they do nothing but diminish the visceral sense you receive as you sit in wonder and experience what it might be like to float hundreds of miles above the earth and realize your minuscule role in the existence of the universe or even the human race. While it helps us consider ideas of accepting our situation, giving up in moments of true despair, facing fears and overcoming obstacles it coaxes us into the understanding that it is in these moments our true character is defined by how we decide to deal with them. These evaluations of human nature and the bigger psychological ideals the film imposes lend that unexpected weight that I didn't completely see coming while facets such as Steven Price's score and Emmanuel Lubezki's cinematography only help to enhance the visual and emotional roller coaster the film takes us on. Gravity is something not easily defined as you can lump it into several genres such as science fiction, thriller, or drama but in the end, like its lead protagonist, the film transcends these categorical limits and becomes nothing short of an experience we will continue to reference, continue to think about and consider when we, if we're lucky, are able to define who we truly are and why we are necessary in this big, big world.